Golden Apples: United—At Cross Purposes! Every once in a while, a yarn and pattern come together and result is a sort of gestalt—the sum is greater than the parts. Tuesday—After knit night at LICKnits—I went home and started a pair of sock (d’Oh! Nothing new there! )—A few days before, when I looked at Patons web page—I saw—on page 4—a color way Cyan of Patons Kroy Stripes—and it clicked—I had that yarn—and look at it—shades of blue—perfect with denim, or navy or any of the other blues that populate my wardrobe. I dug it out. And then at 10PM Tuesday—I cast on—a tubular cast on—one of my default for plain socks--and really these were just supposed to be plain socks. OK maybe a simple rib--but really nothing special. Even before I started I knew I liked the way the yarn was going to work up—though both balls were the same dye lot—some how one ball was skeined up backwards. The stripe pattern is a one way stripe—so it made a difference. Usually (not always, but more often than not) I like to start at the same point and have matching stripes. So I needed to rewind one skein (I ended up rewinding both—but that's just because I have this need to have matching skeins—and I needed to confirm that I had booth skeins the same!) Rewinding it was pleasurable—I got to see how the colors stacked up and changed. I rather intentional started at the end of stripe—so my cast on edge is in a different color—a small detail but a nice one. It sometime hard to know exactly were to start a self striping yarn, isn’t it? Sometimes I let the yarn dictate—but this time I made a small effort for a small detail. After the 1 X 1 ribbed cuff, I opted for a 5X 1 rib—more often than not –I use a 2 X 2, or 3 X1—5X1 is not a rib I use very often.—and then (no, you can’t see yet!) I jazzed the rib up. The result is simple and stunning. Broad horizontal stripes of color—interspersed with a round of two tones—and broad Vertical stripes of ribs—with a surprise in the purl column. 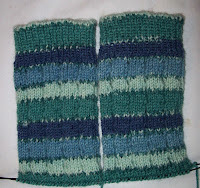 The colors (horizontal) are at cross purposes with the stitch pattern (vertical)—but together—they are perfect partners. Even with out seeing the rib detail—I think these socks look great! Partly is an easy pattern –and partly it is a pleasurable pattern to knit—and partly I love the colors—and I don’t know what else—but my finger have been flying! Now for the heel—I have thought of this—and that and thought maybe I could—or maybe I should. I have hemmed and hawed every waking moment. 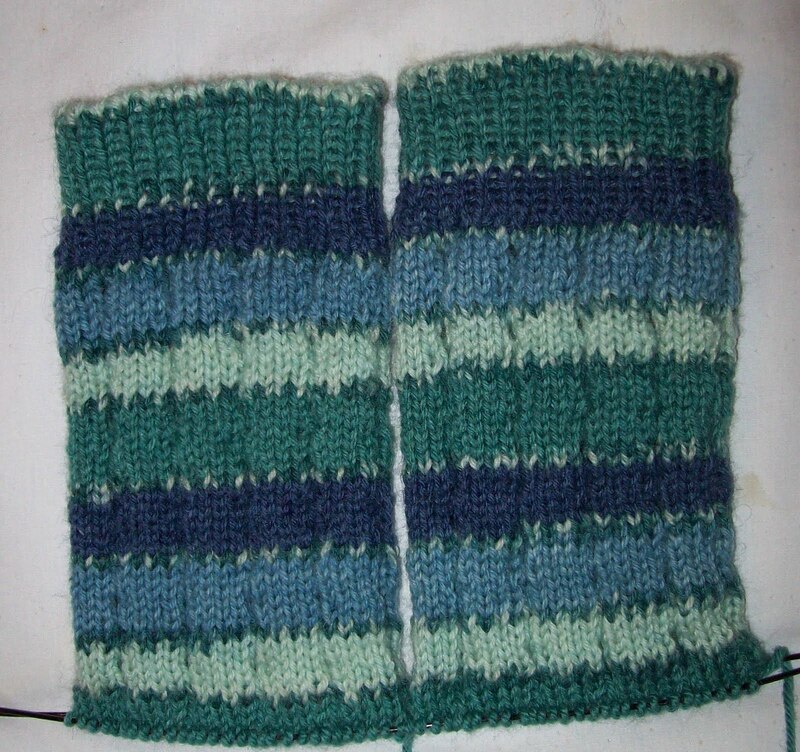 And now have decided—a Flap/turned/gusset heel—even thought it plays havoc with the stripes of the yarn. I’ll let the stitch pattern dominate.